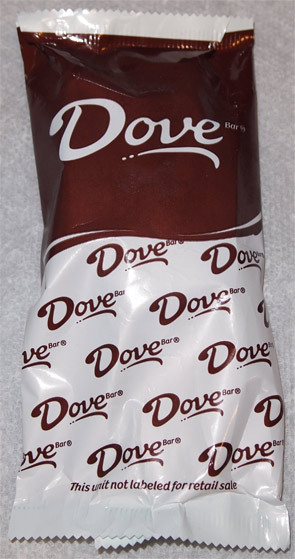 [Discontinued] Mars Mars Mars... look, I had no intention of reviewing Dove bars tonight, let alone did I plan on eating one before dinner, but we had a bit of a problem with our free products that made it necessary to check the Dove bars for damage. Check out the bottom of the post for more. 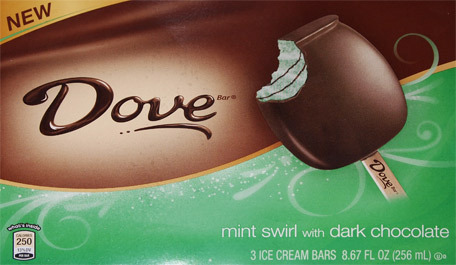 New for 2012, it's mint swirl with dark chocolate dove ice cream bars. A box has 3 bars at 8.67 fluid ounces total, or 2.89 fl oz a piece. See, Mars knows you label the wrapper! I expected something a little bigger, but picking it up confirms that this is still a respectable treat, plus look how dark that chocolate is, that's a good sign. There's a nice minty smell coming from my treat. Ok, I'm ready! I don't want to say the chocolate was masking the mint base, instead I really do think it's just a mild. It's a nice thick Dove ice cream with a pleasant mint, not burning or menthol or anything like that. It's nice to see this much ice cream in a bar. Sure there is a bit of a lingering mint aftertaste, but all well within reason (it would be weird if it wasn't there). You know, this is the first Dove bar I've had in a long time and it didn't disappoint. Sure I regret not eating it slower, but this is top notch construction. I'll definitely try to savor the shell a bit more on the second scoop. I would savor the swirl, but to be honest, I'm not sure it made much of an impact. Several weeks ago, I get an automated mail from Mars that allowed me to sign up for free samples of their new 2012 products. I happily clicked on all the little boxes and patiently waited for them to arrive... and then eventually I totally forgot about it until today. Now instead of the big beefy 2 foot cubes I'm use to, a small third-sized cube arrived and contained what you see above. 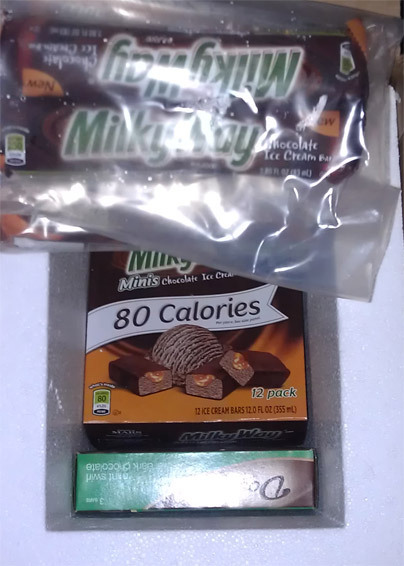 I'll admit it, I practically squealed when I saw the king size milky way ice cream bars. 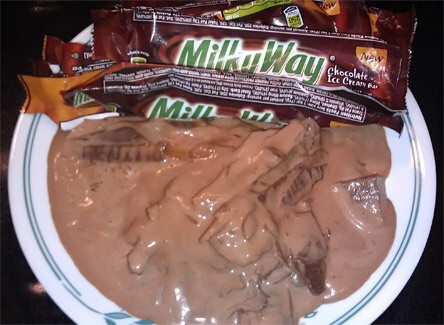 I'm loving the regular sized ones and I sensed ice cream bar nirvana within my grasp... well, until I dropped the bag holding the milky ways anyway. For some strange reason it made a whoomping thud on the ground. Funny, ice cream doesn't usually thud like that. I pick up the bag and notice something ain't right. 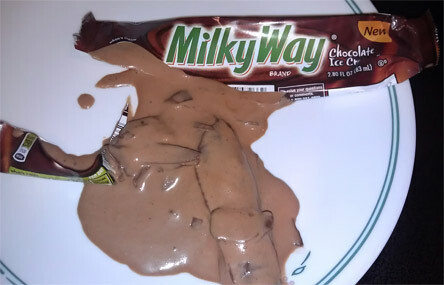 This is what six king size milky way ice cream bars look like after they have thoroughly melted. Oh sure, my son got a huge kick out of watching them gloop together, but I would have preferred to eat them instead. Haha ok anyway those Dove look amazing - would you say they are better than the Mint Magnum because I really loved those! 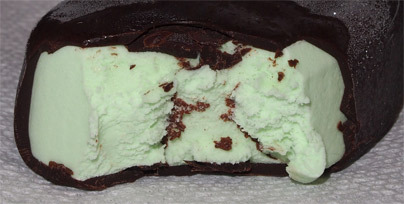 I think dark chocolate always works better with mint, plus the ice cream is thicker and more satisfying. Well in that case, I need to snag these and give them a whirl!